Abuja (Agenzia Fides) - Five nuns of the Order of the Missionary of Martha and Mary of the diocese of Issele-Uku, were kidnapped, in the State of Delta in the south-east of Nigeria. According to news sent to Agenzia Fides, they were kidnapped on October 25 while returning from a burial. They were taken near Agbor, about 25 miles west of Issele-Uku. The religious women were in a vehicle which the kidnappers shot at. 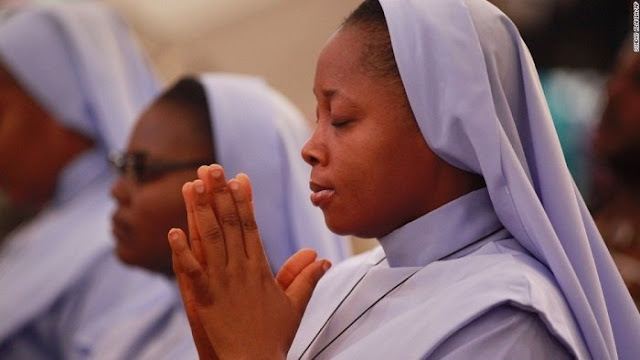 Contacted by the local press, a priest from the diocese of Issele-Uku said: "Pray for the release of the five nuns kidnapped in Agbor, and for the two other nuns who were in the same vehicle". What is this world coming to? El Diablo is rife!! I'll pray for them everyday and will tell our Mothers' groups to pray for their speedy release. Oh My Lord, please see to it that the Nuns get released!! I'm Mrs M Harsant who wrote the above comment.